Once again, as in many past years, I had planned on having a table or two at the annual Long Island Herpetological Society show. Besides having some animals for sale and others for an educational display, I also planned on having some herps for adoption. When Tropical Storm Sandy hit us, the show was cancelled soon after, and my plans to buy some Bearded Dragons to sell at the show fell through (and man was it a great offer I had to pass up). In addition, as is usual with me, I decided to make a good effort at finding unwanted herps that could be put up for adoption at the show. I started looking about 2 or 3 weeks before the scheduled date. 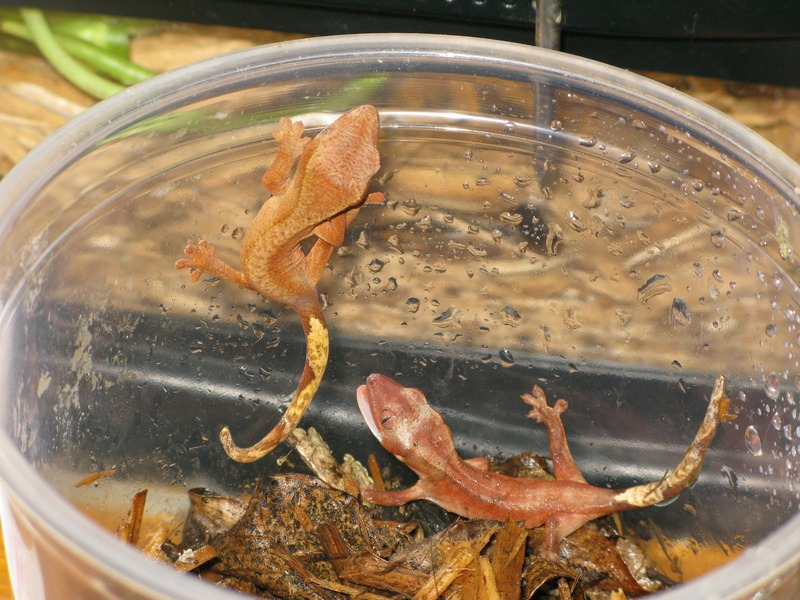 While the cancellation of the show, due to the storm, had me turn down that excellent offer on about 15 baby bearded dragons that I would have offered for sale - the approach of the storm in no way slowed down my search for adoptable herps. In fact, even the storm itself did not keep me from that goal. Did I find anything, sure I did. 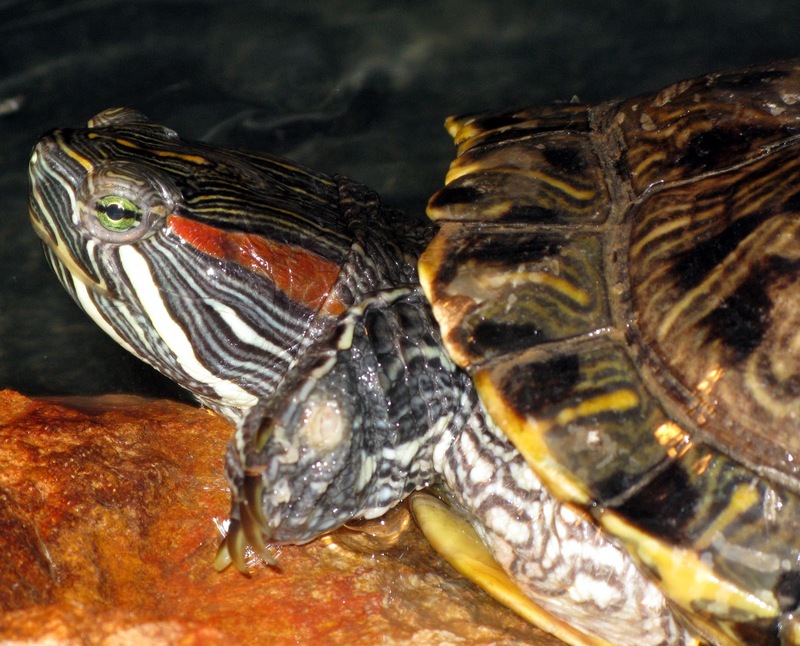 I came up with an ad on Craig's List or Backpage about someone who was desperate to find a good home for a Red Eared Slider. What else could it have been - at least it was not a Green Iguana. I called them, it was a couple who lived on the upper west side in Manhattan. They explained they were leaving to go work in East Africa for at least several months and had no one to care for the turtle in that time and apparently there had been only one other person who had showed interest; he had failed to get back to them as promised. They were leaving on the Thursday, after Sandy. As you may recall the storm hit on a Monday night and lasted through at least half of Tuesday. As I remember it, it lasted a bit longer. The area was a mess. Yet, I had agreed to go pick up the turtle on Wednesday if the roads were passable. That had been agreed upon on Sunday or Monday (that would have been early on Monday before Sandy hit hard). After seeing much of my home's roof blow off (I had taken the dogs out and found shingles all over my yard and then looked up to find that indeed they were from my house and I watched many more get blown off) and some other damage to our house, and hearing about all the other damage, and the flooding of the tunnels to NYC, I was not much in the mood to try to drive into Manhattan. I expected heavy traffic and long delays getting there but I had promised and they had no one else who would take it and were leaving the next day for Africa! I braved the roads and to my surprise there was little, if any, traffic on my way to Morning Side Heights / Harlem through Nassau and a bit of Queens, over the Throggs' Neck Bridge, across the Bronx on the Cross Bronx Expressway and into Manhattan. I even found parking just one door away from their apartment building. The couple was very nice. 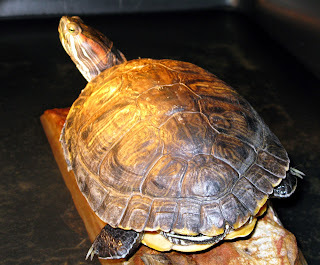 They told me a brief history of the turtle - they had it for years since it was small. It is not small now. They also told me that he (the guy not the turtle) was a doctor and she (the gal not the turtle) was an aid worker, both going to do good things for folks on the Dark Continent. Sorry but I forget their names, I am terrible that way. 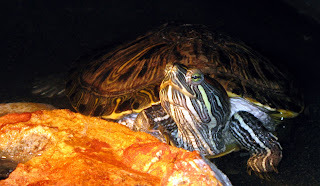 They showed me the turtle, and started to empty the water out of its tank. The tank was a 30 long but had a big crack in it that had been sealed with silicone and actually held water regardless of the crack. It came with a couple of filters and lighting and turtle food and, of course, with the turtle. 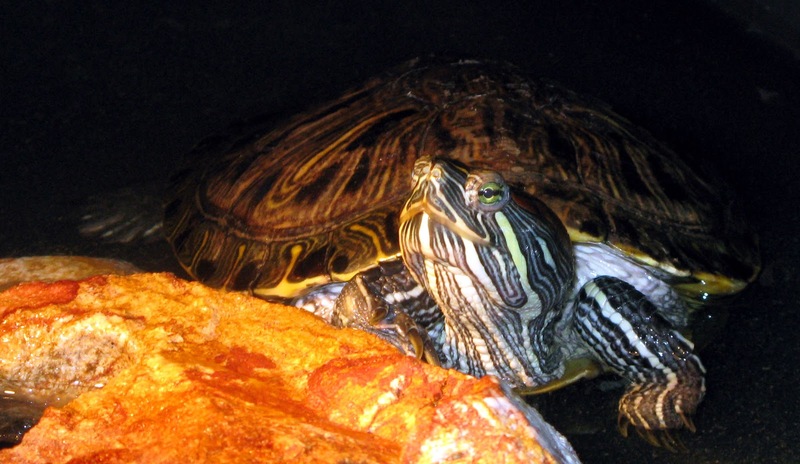 Yes, these are all pics of the actual turtle up for adoption. All should be clickable images, click to enlarge. The turtle, as you already know, is a Red Eared Slider. It is most definitely female, unless she/he is an incredible freak of nature that resembles the female of the species but is really a male in disguise. Trust me on this one, it is a gal turtle. It is an almost fully grown adult, its carapace is about 8" long. It has good body weight, probably meaning two things - it was well fed (and still is being fed well) and it is probably healthy. She had been fed mostly turtle pellets. Since I have had her, she has been feeding on aquatic turtle pellets and goldfish. After I started feeding her some goldfish, she has been kind of slacking off on the turtle pellets but does still eat some that I offer her. She has no apparent health issues that I have noticed. She was shedding scutes on her carapace when I got her - either due to a normal shed due to growth, or possibly due to a health issue but I think the former. All but one or two of the surface scutes have come off revealing an apparently strong new scute where each of the old surface ones had been before. Her shell is nice and hard as it should be. She is pretty active. Right now I have her in a temporary enclosure, a plastic concrete mixing trough (I threw out the cracked tank that I got with her) but she could use a larger abode, at least a 50 gallon aquarium sized tank. If you are an experienced herp keeper, who knows the requirements for keeping and maintaining a healthy basking water turtle, such as this Red Eared Slider, then feel free to contact me via email if you are interested in adopting her. Bear a couple of things in mind. This is an adoption not a turtle, plus tank, plus accessories, plus food giveaway. I am offering the turtle and nothing else. The accessories I got will probably wind up in the LIHS auction in June. Also, keep in mind, you must be a responsible adult to adopt this from me. I do not make adoptions of animals to minors. In order to adopt it, you must convince me that you know how to care for turtles prior to getting it from me. If you are adopting this as a pet for a child, bear in mind, you are the person responsible for the care of the turtle and turtles can live a very long time, like 50 years; also bear in mind that turtles can bite and this one definitely tries to bite but luckily I still have all my finger tips. Also note, there is not an adoption fee but I would, as I always do, ask for a donation if you take her. While a donation is not mandatory, I highly recommend at least $10; all of which will go to the LIHS. To contact me click on the link, near the upper right hand corner on this page, to view my complete profile (or you can just click on it here). In that profile is an "Contact Me" section with an email link to me. At the Christmas/Holiday party, this past Sunday, a board member or three told me that I have been given the green light to go ahead with this blog for the LIHS. They also told me that board approval was unanimous and I think that is a good thing. So, I am going to kick this off for real and get underway by posting here at least once per week with LIHS and herp related blogs. If anyone, who is an LIHS in good standing, wants to submit a blog post to me for publication here on this blog, please send it to me via an email. I ask that you send it as a file attachment in either MS Word or something that can be opened by MS Word so I can easily cut and paste the article on the blog. Send photos, to accompany the articles, as JPG or JPEG files attached to the email. Of course, you can also just send photos for publication on the blog but I ask that, if you are just submitting photographs, you at least supply an explanatory caption with each picture. I do not think I can cut and paste PDF files here so please do not submit them. As far as content goes, keep it LIHS and or herp related. I was given the okay to approve/disapprove anything that is submitted with the exception of legal or political pieces; those must receive LIHS board member approval before being posted. I will not post any for sale ads on the blog. I will post links to member websites if it is requested, by a member in good standing, that I post his or her herp related website address on the blog. These links can be to things like: herp hobbyist sites or blogs, commercial herp sites and so on. Wish me and the LIHS luck with this and please send in some things to post on the blog. If anyone has any photos of the Holiday party, that would be a good place to start as I did not have a camera on Sunday. One really has to start wondering where all of the stray alligators, found recently on Long Island, have been coming from. Crocodilians are, I think, illegal to possess in NY; although, one of the articles to which I link below quotes someone who says you need a permit to keep them in New York State. Either way, it is definitely illegal to release or abandon them within New York. 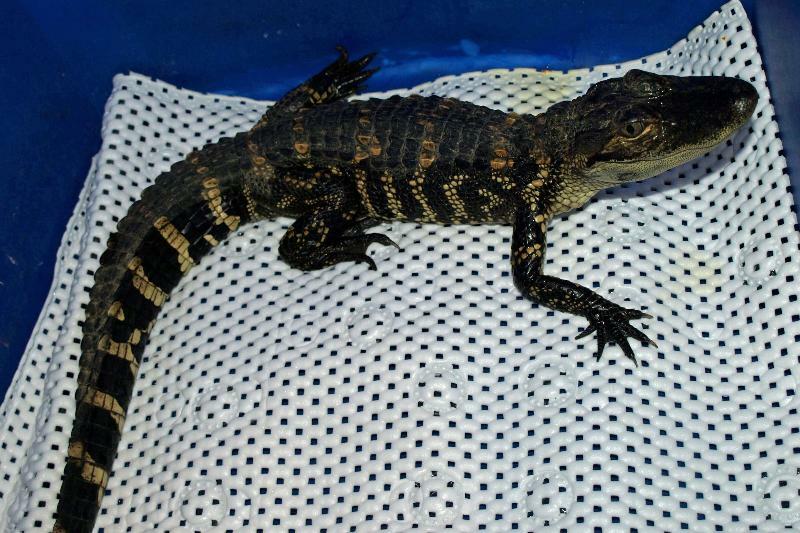 Yet, over the past 6 weeks, there have been 9 alligators, all between 18 inches and 3 feet long, found on Long Island. The sad thing is that any alligators released in NY are sure to die if they are not found and rescued. American Alligators are native to southern states within the USA to include: Virginia, North Carolina, South Carolina, Georgia, Florida, Louisiana, Alabama, Mississippi, Arkansas, Texas, and Oklahoma. I can attest to the fact that the alligator, which was once an endangered species, is one of the great success stories of wildlife management and is so common once again as to be listed as a game animal, with regular hunting seasons, in many states. I have seen them in large numbers in my travels through Florida, Georgia, North Carolina, South Carolina and Texas. 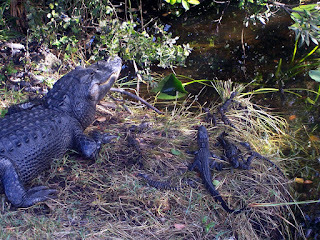 They are thriving in nature and also are often bred, for their meat and hides, in alligator farms in the southern USA. In some states they are legal to keep as pets but they do not make a suitable pet for any but the most advanced of keepers, who has the proper facilities in which to keep them. small they start out and how big they can get. 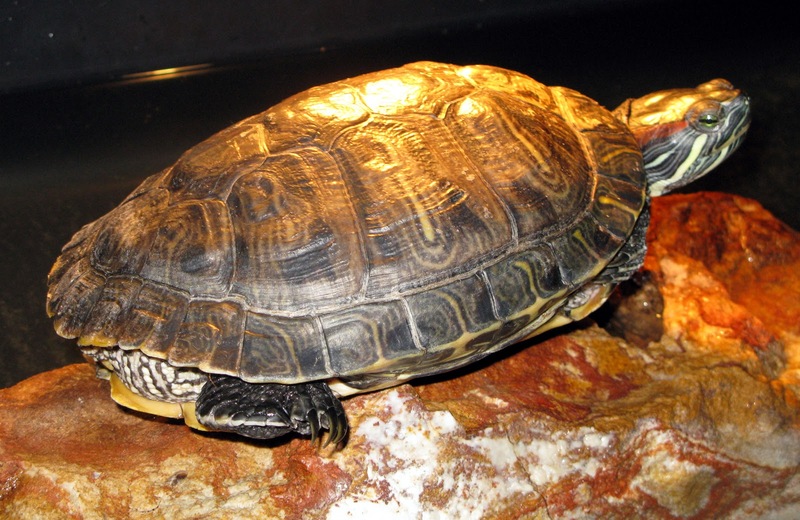 They start out as adorable babies, a possibly very tempting offer to buy where legal, but within a few years easily can reach unmanageable sizes for even experienced keepers of reptiles. 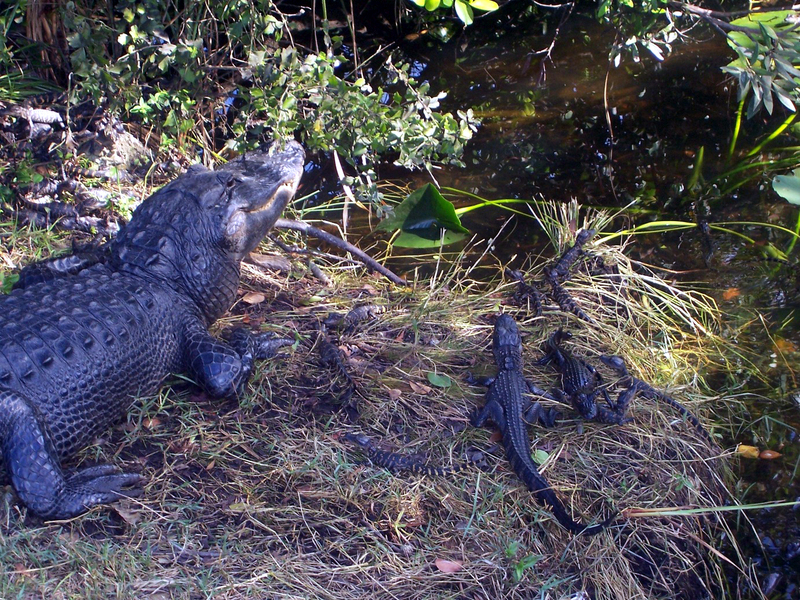 My advice, look at them, admire them, learn about them and take plenty of pictures of them (all without getting to close as medium to large alligators can be quite dangerous to even adult humans) and otherwise leave them alone. 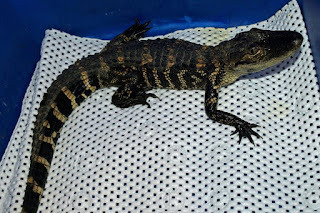 Do not buy one as a pet because chances are it will grow too big, too fast, and that cute adorable baby alligator will tun into something that you want to get rid. If you bought one and later tried to get rid of it, you would likely discover that there are not many institutions and even fewer individuals, willing to take them in. Thus, with no way to properly care for it and no one else willing to take it to give it a suitable home, you might wind up considering turning it loose in habitat not suitable for it to survive as has happened with those here on Long Island. One also has to wonder, will crocodiles show up next. See You Later Alligator - In A Little While Crocodile! One of these babies was 'helped' out of the egg about a week ago, the other hatched out on its own today. The one higher up in the photo is the older one. I have been feeding them very small crickets, newborn baby Blaptica dubia roaches, Rapashy Crested Gecko Diet and mango baby food. I am really interested to see how the younger one develops and am anxious to see its coloration as an adult because certain areas, like the band on its head, the back of its rear legs and some other spots almost look as if the flesh is colorless or that the color is mostly washed out. We are trying somthing new here at the LIHS with the creation of our blog: LIHS Blogger. The blog will give the membership a chance for additional participation in the LIHS as members will be allowed to submit blog posts and photographs to the blog editor, or to LIHS board members, for review and possible publication on the blog. The LIHS executive board strongly encourages all LIHS members to take an active part in this new venture for the society so that we may better able to share our passion for herps with one another and the public. The Long Island Herpetological Society, Inc. (LIHS) is a New York State not-for-profit organization, formed in 1987, to educate the membership and the public about the natural history, conservation and captive care of reptiles and amphibians (herps). Copyright: all rights reserved by the Long Island Herpetological Society 2012, 2013, 2014.. Powered by Blogger.